Facebook is an interesting paradox of a site for marketers. On the one hand, it’s probably the single largest repository for personal information in the history of mankind. On the other hand, Facebook goes out of their way to avoid giving any of that information away; even huge corporations paying for advertising data are getting aggregated, anonymized data. The only entities that can access specific personal information about any given user are friends of that user who can see their profile, and agencies like the NSA or the Department of Homeland Security, who have a governmental right to access that data to protect the country. 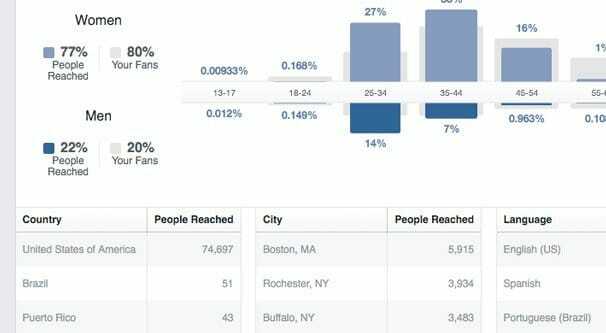 If you’re a business owner with a Facebook page and you want to learn as much as you can about your fans, you’re actually surprisingly limited. You can get a decent amount of data, but again, a lot of that data is going to be about your audience as a whole, not any specific people. This is why it’s difficult to even scan your fans for fakes. In fact, there’s very little data you can access outside of Facebook’s own analytics suite, the Insights program. You can see an example of what is accessible to you by looking at something like LikeAlyzer. It will show you publicly available data, but it doesn’t have internal access and very little is available by API. Rather than try to provide you with a list of tools you can use, I’m going to show you how to accomplish this with Facebook Insights. You can find it by navigating to your page and then clicking the Insights tab up at the top. I’ll mostly just be giving you tips and information items you should look at, why they’re important, and how you can encourage them. Reach is a measurement of the number of people who actually see your posts, as opposed to the audience you have as a whole. Say you have 1,000 followers on your Facebook page, and you have 6% organic reach. That means out of those 1,000 followers, only 60 of them have actually had your post render in their browser or on their phone while they are browsing Facebook. This isn’t strictly accurate, though. One quirk of reach is it just measures people, not your specific audience. People who see your post but who aren’t part of your followers still count toward your reach. If you have a post go viral and 1,000 people see it when you only have 500 followers, you technically have 200% reach. It’s also a measure of unique viewers, not of views in total. If one person sees your post four times, that’s not +4 to reach, it’s just +1. Reach comes in three flavors; organic, viral, and paid. Organic reach is the people who see your posts based on you posting them. They show up in the news feed for these users, and these users see them. Viral reach is the people who see your posts based on other people interacting with them. When someone comments on your post or shares it with their friends, those friends who see it count towards viral reach, not organic reach. Paid reach is the people who see your posts based on you promoting them as news feed ads or boosted posts. Any time a user sees a post because you paid money for it to appear, that view shows up as paid reach. Posts with little or no paid reach simply mean your ads are either not running or not working. Generally you will have some level of paid reach for any paid ads, otherwise you wouldn’t be charged for them and you’d know something was wrong. Viral reach is important; the posts with the most viral reach are the ones most successful at getting people to share them. You should study these posts and figure out what has made them so shareable. You can then work to replicate that success with future posts to establish a new baseline. When you learn about who your audience is, you learn how to reach them with posts, both organic and paid. Organic is actually harder; with paid posts, you can simply throw money at it until they see it. It’s inefficient, but possible. With organic posts, if you aren’t appealing to users, your visibility declines, and it becomes harder to reach them in the future. What percentage of your audience is active? You can see how many people are active on a monthly basis. If a significant proportion of your audience is inactive, they could be fake accounts, or they could be remnants of an old account campaign. It can help rationalize why various marketing campaigns seem to have poor reach metrics. What is your most common age group? Marketing to 60 year olds is different than marketing to 40 year olds, which is different from marketing to 20 year olds. What is the average education level of your audience? You don’t want to market diploma frames to people with no higher education, for example. It can also give you an indication of relative potential for your audience, and ambition. What other relevant page likes are common among your audience? For example, people who like Moz probably also like the Content Marketing Institute, Jon Loomer, Social Media Examiner, and others. You can see competitors, possible partners, and people to monitor for ideas through this list. What platform do they use to access Facebook? You might discover that a huge proportion of your audience uses predominantly mobile devices, as opposed to desktop or a mix, which will help you tailor your content. It’s hard to produce a desktop-only CTA that’s effective with a mobile audience, after all. You can get an incredible wealth of overall information, you just can’t see the demographics of specific users, or see which specific users fall into which demographic. Personally identifiable information is generally protected. I don’t mean engaged to be married here; I mean engaging with your page. It’s good to see raw numbers of likes, shares, and comments on the rise, but you also need to consider additional comparisons. What percentage of the audience you reach engages? 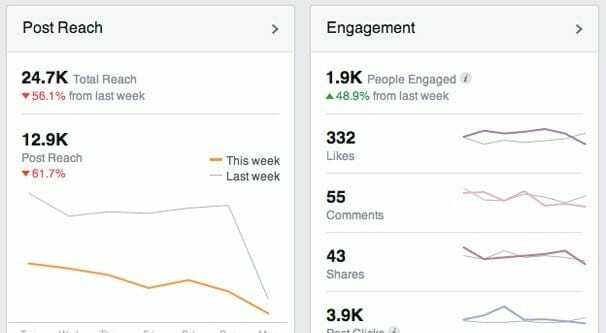 If you put your engagement up against your reach, you can see how engaged your actual audience is. If you have 1,000 fans and only get 45 likes on a post it looks like a low rate. However, if you consider at a 6% reach you only reach 60 people, that’s a 75% engagement rate, which is really nice. Having a highly engaged audience is crucial for understanding how to reach them on a broad scale. You can also compare this on a post by post basis, to see which posts get better engagement rates compared to reach. You might find that your most engaging posts don’t actually get a lot of reach, while your most viral posts don’t get a ton of engagement. It’s common, and it takes a lot of study to figure out how to cross those two lines together. One thing you see increasingly often these days is the concept of appropriate timing for social media usage. One of the things you can see in Insights is the aggregated activity levels of your audience from hour to hour, day to day, and week to week. Using this tool, you can then figure out when the best time to make a post will be. Sure, there’s a lot of data on this out there. Buffer loves this study, though they are quick to point out that the ideal timing concept is more important on more time-focused platforms, like Instagram and Twitter. Every time I write about social media timing, I make sure to stress the importance of individual studies. What works out to be perfect timing for me might miss two thirds of your audience. You need to take your industry, your location, your payments, and a lot more into consideration when you’re studying timing. 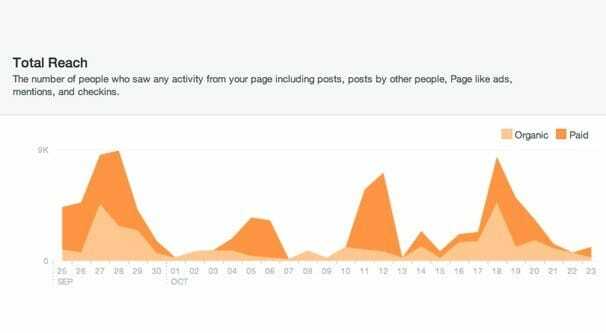 Thankfully, this tool in Insights will show you the peak active times for your audience, adapted to your local time, so you can see at a glance when the best time to post is if you want to reach as many as possible. I’ve said that there’s not a lot of information available to the public, so there aren’t a ton of third party tools that help you see information about your page or audience, but “not a lot” is different from “none at all.” Fanpage Karma is a tool you can use for comparisons between one page and another. Why would you want to see this? Well, it’s a good idea to keep tabs on the competition. Figure out who your competitors are and who the giants in your industry are, and compare yourself to them. You can treat this as a competition, a race to the top, and you can keep an eye on how your competitors are performing. Audience Overlap is the ability to take any two audiences on Facebook and compare them to find where common ground can be seen. For example, you have an audience of total Facebook fans, an audience of mailing list subscribers, an audience of converted customers, and whatever other audiences you want to set up and maintain. You can compare these to each other to see all kinds of info. Compare your email subscriber list with your website visitors, as tracked by a Facebook pixel. This will help you figure out what percentage of your users are signed up, and can allow you to identify commonalities amongst the people who aren’t signed up, to better reach out to them later. 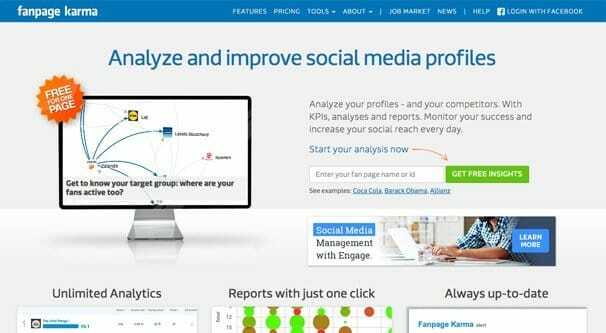 Compare your Facebook fans with your website visitors. This will show you how many of your site visitors are fans, and vice versa. You might be surprised to see how little overlap there is between the two groups. The better the overlap, the more focused your marketing can be. 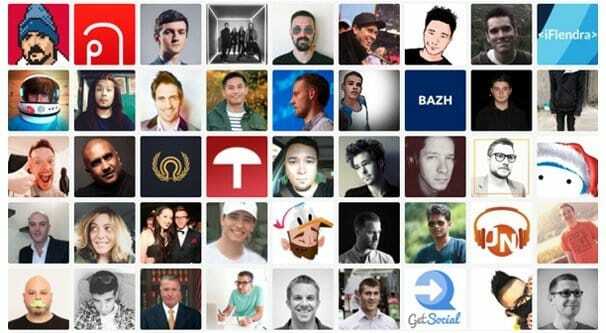 Compare a generated lookalike audience with your current fan list. A lookalike audience is meant to be people who resemble your followers but who don’t already follow you. If a significant portion of that lookalike audience is following you, you need to generate a fresh one. 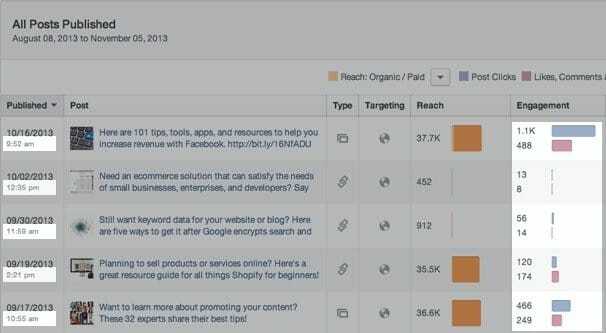 Compare any two audiences you use for Facebook ads. If there’s a lot of overlap between two active use audiences, you will want to diversify them somewhat. The problem is you end up bidding against yourself for a certain percentage of those users, as well as saturating their feed with your ads from two different groups. Comparisons can be very educational when you frame them properly. One audience info panel you can find is the top page likes for your audience. 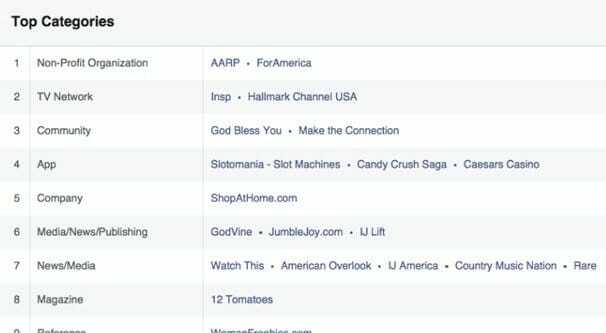 This will show you interesting crossovers between your audience and others on Facebook. Which athletes do they like the most? Which sport events? Which companies? You can see them ranked by industry, by audience size, and even by affinity, which is how likely their audience and yours are to overlap. This can be used to target ads with co-interests, as well as think about possible brand partnerships. There’s a lot more you can come up with in Facebook Insights, but I think I’ve covered enough to get you started. If you have a particular favorite slice of information you like to study, share it with the rest of us in the comments below!